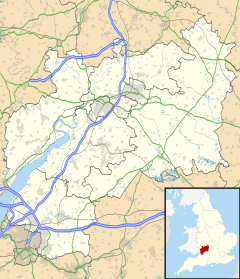 Emersons Green is a town and parish in the unitary authority of South Gloucestershire just to the north of Bristol, England. It was developed from farming land during the 1990s and early 21st century, and sits within the historic parish of Mangotsfield. Coal was mined from the area during the 19th century. To the south there is a quarry, which has been reactivated. A science and technology park, in conjunction with Bristol University and University of the West of England, named Bristol & Bath Science Park, has been built on an area of land adjacent to the M4 motorway and the A4174 ringroad. Construction of the £300 million Bristol and Bath Science Park began in early 2010. A link road connecting the M4 to the Avon ring road (A4174) has now been considered a necessary addition to the area, to accommodate the increase in traffic due to the science park. It was opened in September 2011 and is expected to create 6,000 new jobs within the science and technology sector, when it is completed in 2020. Emersons Green was until 1927 a hamlet in the civil parish of Mangotsfield. From 1927 to 2015 it was in the civil parish of Mangotsfield Rural. The parish was renamed Emersons Green in 2015 and enlarged by the addition of areas of the civil parishes of Pucklechurch and Westerleigh. The parish council elected to be known as Emersons Green Town Council. The boundaries of the parish were adjusted to take in the housing development at Lyde Green, and the Science Park. The M4 motorway is now the north eastern boundary. Lyde Green  is a new development within South Gloucestershire that was originally farmland. Its transformation into housing began in the mid 2010s. It is built to the east of Emersons Green. Wikimedia Commons has media related to Emersons Green. ^ "Emerson's Green Walks" (PDF). South Gloucestershire Council. Retrieved 10 December 2015. ^ "Location/Contact". Bristol and Bath Science Park. Retrieved 10 December 2015. ^ "Bristol and Bath Science Park opens". Retrieved 10 December 2015. ^ "Corporate Governance Review" (PDF). South Gloucestershire Council. 22 May 2013. Retrieved 29 January 2018. ^ "About Your Council". www.emersonsgreen-tc.gov.uk. ^ Emersons Green East development brief. This page was last edited on 16 February 2019, at 22:06 (UTC).